Weather: Foggy again but cooler. 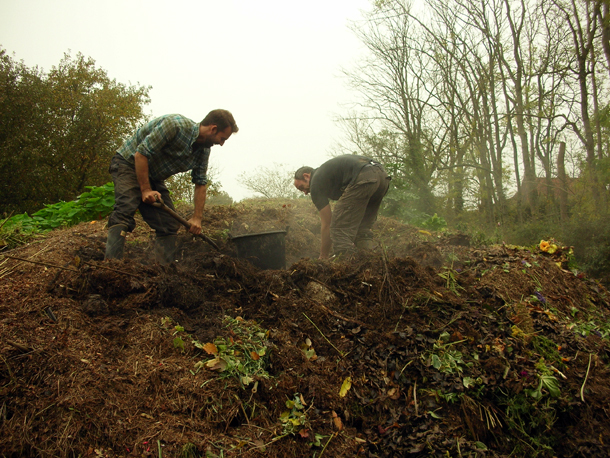 We dug into the oldest of the three compost mounds today. Unfortunately a layer of thatch at the bottom had not decomposed yet, but at the heart of it were precious layers of deep dark black humus smoking away. We chopped into it as vertically as possible with a spade, and like peat it gave way easily. 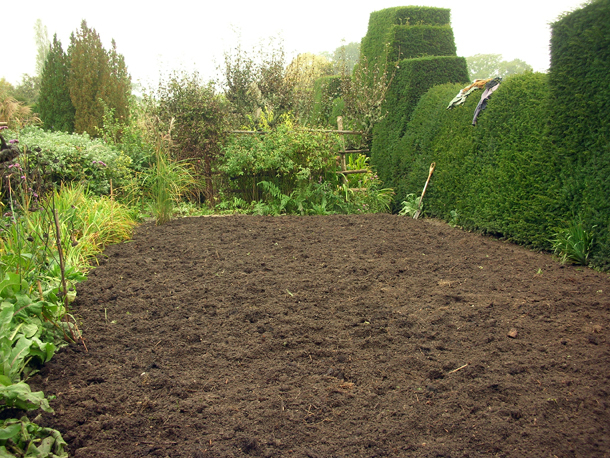 Then we used the good stuff on the bed we had cleared yesterday in the High Garden for the Hemerocallis trials. First we laid it on the surface and then we dug it in about a spades depth. I also took part in making loam and it was fascinating. Most gardens & nurseries will just buy it in from commercial businesses as it is a labour intensive process, so it is a rare insight to see and do such a thing. Dixter is quite a self-sufficient garden and generates a lot of their own including propagating their own plants. It gave me a deeper appreciation and a better understanding of the effort it takes to do these things. There are already mounds outside the nursery used for this purpose. We chipped humus off 'the cliff' - a side of the mound that had been worked on already and is like a steep precipice, especially as strata like layers have been revealed. We added even darker and richer stuff from the top into it. Rotovated it several times (we ran the machine over it at least 13 times - basically it is the 'Tracmaster' but with a rotating blades attachment changed onto it) so that it was broken down into a fine tilth. Then threw it into a wheelbarrow through a sieve so that it was even finer. Then this was transported to the soil shed ready for going through the soil steriliser. Maggie Tran was the 2012-13 Christopher Lloyd & Historic Botanical Garden Bursary Scheme (HBGBS) Scholar at Great Dixter. Funded by the Heritage Lottery Fund. Follow her new blog here.